Optimising warehouse space is one of the key jobs of the warehouse and operations manager. Every piece of poorly used space is a potential loss of revenue through inefficiency, just as every piece of efficient space has the potential to boost revenue. We’ve outlined 3 key space saving strategies that managers should be considering when trying to get the most out of their warehouse. Aisle Width is something this blog has previously discussed with regards to increasing operational safety, as having a wide aisle is a major contributor to decreasing vehicle accidents and costly delays. Many warehouse managers report that product proliferation and decreased order quantities in the market are demanding an increased pick face size and less of a focus on deep storage in warehouses, this lends itself to a narrower aisle configuration. However, the balance a warehouse manager must strike is one between keeping the aisle wide enough to be safe and function at maximum speed but narrow enough to maximise storage space within the warehouse. Wide Aisles: These are aisles wider than 3 metres. 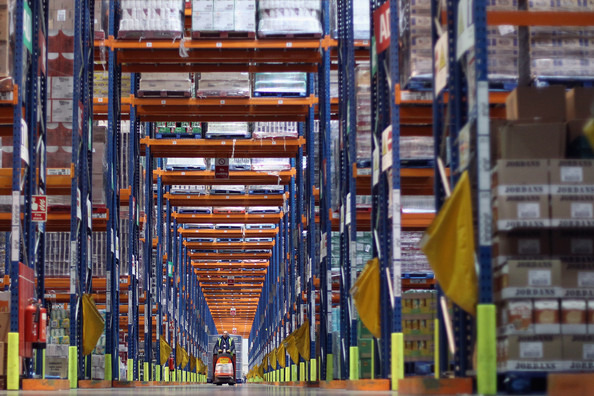 Having wide aisles allows for the maximal operational speed of your warehouse. This needs to be balanced with the decreased rack space. Wide aisles are ideal for warehouses that have large order quantities and reasonably small product ranges. Narrow Aisles: Usually anything between 2.7 - 3.0 metres clear load-to-load. Narrow aisles require either a stand-up reach truck or a 3-wheel forklift. By installing a narrow aisle system you can increase the storage capacity of your warehouse by 10-15%, however, you will need to purchase new narrow aisle forklifts to function in the narrow aisles. Also, the general trade off for increased density is speed, with narrower aisles the speed of warehouse operations drops due to the need to navigate safely with less margin for error. Very Narrow Aisles: A very narrow aisle system will further increase the density of your storage, offering up to 35% more space than a wide aisle configuration. However, it will also incur a further loss in operational speed. The aisle width is generally the load width plus a minimum of six inches for pallet overhangs and forklift mast sway. Very Narrow Aisles also require more specialised machinery with the turret and swing mast trucks costing up to $100,000 and order picker trucks between $20,000 and $25,000 each. If your warehouse bay is particularly high as well (over 12m) the cost can increase further as you will need more customised machinery. You also need to consider your warehouse design and layout when examining the possibility for changes in your aisle width. The column spacing and position of other fixed objects in your warehouse will dictate your ability to employ new aisle widths. Also consider the positioning of lighting and sprinklers, as you move the aisles it is highly likely that you will also have to move those features to effectively service the new configuration. 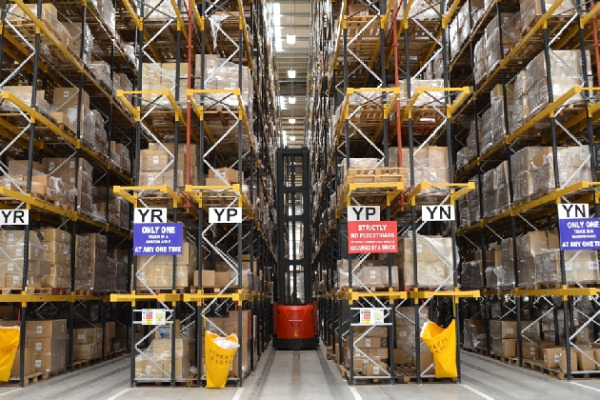 Further space savings can be made through the correct application and optimisation of racking. Vertical Utilisation: Maximising your vertical storage is a quick way to increase storage space. How much average clear space do you have in each rack? Look at the ratio of used vertical space to clear space, every section of storage should be examined to ensure that there is not vast amounts clear space. A well-designed warehouse will generally have 75-80 percent of available vertical space used. If you don’t’ need to optimise your vertical space then perhaps you have too much floor space and are paying for an excessive amount, when you could be more efficiently using your vertical space. The increased spread of your stock is incurred in the costs of vehicle distance travelled, lighting bills, climate control costs and numerous other features. Decked Racks/Case Flow Racks: If the product is stored or received in loads less than one-half pallet size you should consider decked racks or case flow racks. A pallet accounts for around 10% of storage required and by removing the pallet you gain back that 10%. This configuration also increases the pick face density by narrowing to a case width. Some people report gains of 20-50%. Tunnel Rack: Often a completely underused space in warehouses is the area covering cross aisles. By converting this to racking you can gain 5-10% more storage space. Generally the bottom of the tunnelled rack would start around 3 metres to allow sufficient clearance for vehicles navigating the warehouse. 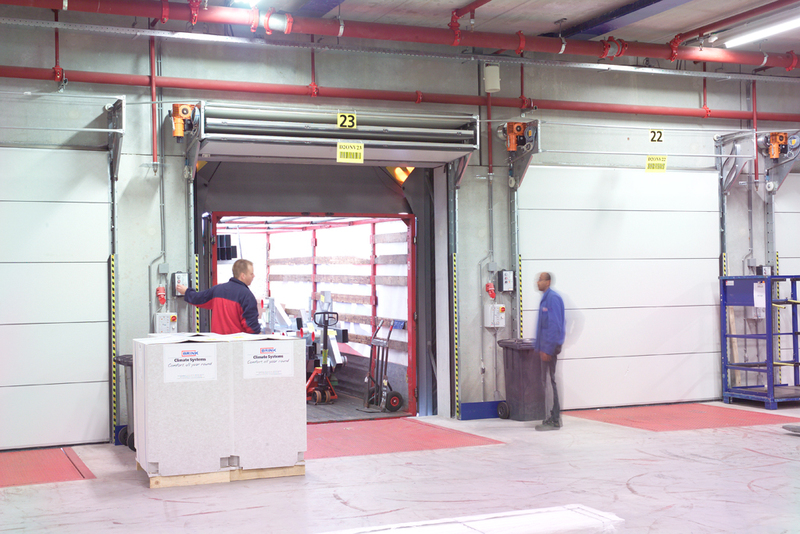 Warehouse doors also offer the opportunity for serious space saving and optimisation. Traditional overhead doors are made with several jointed panels that depending on their rail system roll up above the doorway or follow the camber of the ceiling. Overhead doors were originally introduced to provide an alternative to non-insulated rolling shutters, they were effective because of their ability to be large, have a wicket door and transparent panels. These doors however have one major disadvantage. That is the mechanism's used to retract them and the amount of space it can take up when the door is retracted. Most of these overhead doors will require the installation of a rail system that is both expensive and can impair the structural integrity of the ceiling or roof structure it is fitted to. The counterbalance springs used with these doors also take a lot of tension to balance the door and thus have a very high maintenance level. A simple solution to the limitations of an overhead door is the use of a compact sectional door instead. This is a door that folds into a compact pile at the top of the doorway and it can even be retracted on the external side of the door. It does not need to take any space along the ceiling or require structural supports and has a universal rail system that allows it to be employed in any doorway. The space saved by this door creates more space for infrastructure such as heaters, lights, sprinklers, piping or other tubes. By creating more space near the doorway the compact sectional door allows architects and warehouse managers to optimise the building for maximal storage space and efficiency. The doors also have the added benefit of not needing high maintenance counter balance springs and with the electric motor being attached to the self-supporting system of the door, structural support is unecessary. What do you think? Are these the best strategies available or do you have some others that might be more effective? Please post in the comments below. If you would like to read more about increasing warehouse efficiency have a look at our blog on telematics and fleet management systems. Or if you would prefer to read more about compact sectional doors as a space saving solution click on the button below.